Following the recent birth of her baby, Strictly Come Dancing star Erin Boag is now back in her sparkling dresses and dancing with her professional partner Anton Du Beke. The charismatic couple have always been one of the most popular professional dance couples on the BBC television show, but Erin was missing from the last series due to the birth of her first child, baby Ewan who was born on his daddy’s birthday last April. 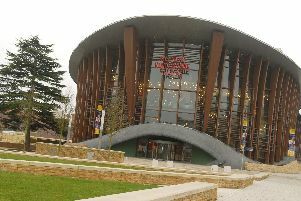 Now, with the baby nearly a year old, Erin is back on the road with Anton and they appear at Aylesbury’s Waterside theatre next month in a matinee performance with their show That’s Entertainment. In an interview Erin said: “It’s a wonderful show combining the pleasures of music, song and dance throughout the performance. We also have a Q and A session immediately after the interval that always brings some hilarity to the proceedings. Erin and Anton will be joined on stage by six world-class ensemble dancers, vocalist Lance Ellington who is often seen performing on Strictly, and the 25 piece London Concert Orchestra conducted by Richard Balcombe. During her pregnancy Erin stopped dancing shows at five and a half months because she could no longer fit into her dresses, but she continued teaching until 39 weeks, four days before she gave birth by Caesarian Section. The baby was born on April 24, the birthday of her husband Peter, a business consultant. Anton, who is the proud Godfather, has met Ewan many times of course. Erin said: “I loved the time that I had off, spending it with Ewan. I love spending every spare minute I have with him, even if it is 3am in the morning. Erin’s mother is coming over from New Zealand to look after Ewan during the tour. Erin said: “She calls it Nana duty. I know that she is loving every moment of it and it is nice for me that when I am away I don’t have to worry at all because he is in good hands. That’s Entertainment comes to the Waterside on Sunday March 8 at 3pm. Tickets cost from £28.50 to £49.50, the box office number is 0844 871 7607.